A Flat roof Solar PV Installation in Great Missenden, Buckinghamshire. is an independently run business specialising in the design, supply and installation of solar panel systems which generate clean and efficient electricity for households and businesses. Based in the Chiltern Hills of the northern home counties Chiltern Solar operate predominantly across Buckinghamshire, Berkshire, Hertfordshire, Bedfordshire, Oxfordshire, Middlesex, London and the South East of England. Chiltern Solar offer you the latest technology from market leading brands at affordable prices, making solar power a practical solution for everyone. We use the most efficient solar panels available giving you the best value for money and return on your investment. 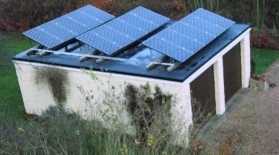 How can Solar Thermal save you money?